When we think of supercars like the McLaren 12C, we don't necessarily think of environmental friendliness, but maybe the cliche doesn't necessarily reflect reality. The McLaren Group has been recertified with the Carbon Trust Standard for successfully measuring, managing and reducing carbon emissions across all of its operations in the United Kingdom. Not only is this the second time in a row the company has received the award, but it's Vodafone McLaren Mercedes team becomes the first-ever Formula 1 team to be awarded and retain the award as well. 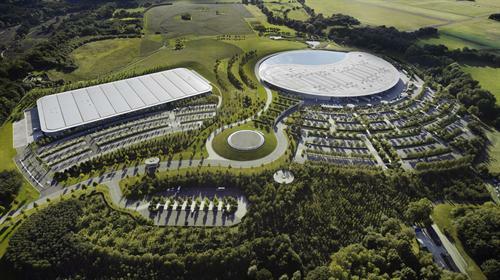 The McLaren Group first received the Carbon Trust Standard in 2010 after years of rigorous assessment and as its energy efficiency strategies for all levels of corporate operations, from production to design and more, it has managed to reduce its carbon footprint by 9% despite a two year period of significant expansion for McLaren Automotive, including the construction of the new 32,000 square meter manufacturing facility, the McLaren Production Centre (pictured, on left - Technology Centre on right). This Carbon Trust Standard compliance and improvement has also come even as the company introduced two new vehicles, the McLaren 12C and 12C Spider. * A centralized plant in the Technology Centre to ensure shared systems, including air compressors and chillers, are operating at optimum efficiency by reducing the amount of partial load running two systems would have. *Heat recovery systems in the Production Centre capture excess process energy and move it to other parts of the building that require heating. *New, more energy-efficient simulation equipment for the McLaren Racing team has meant 300 tonnes of CO2 saved annually. *Deployment of new, longer-lasting and more energy-efficient lighting across the Technology and Production Centres. “It is really encouraging to see a high profile organisation like McLaren Group making real improvements to retain the Carbon Trust Standard. McLaren Group’s achievement is clear evidence of the significant results in carbon reduction that can be delivered through senior sponsorship from the top and entrenched good practise throughout a business. McLaren Group’s carbon reduction relative to head count demonstrates that growth can be decoupled from carbon to grow your business without proportionally increasing emissions”.